Finding the best places to go is an essential part of our lives, as are the people and resources that help us make those decisions. In fact, the opinions of friends, family or other trusted sources are often the first we seek when looking for the perfect restaurant for date night or the cafe that makes the best latte ever. 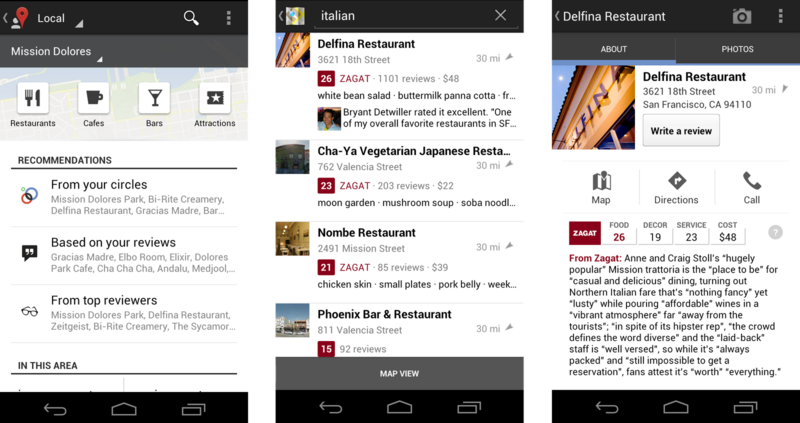 Today, we’re rolling out Google+ Local, a simple way to discover and share local information featuring Zagat scores and recommendations from people you trust in Google+. Google+ Local helps people like my husband turn a craving—“Wow, I need brunch”—into an afternoon outing: “Perfect, there’s a dim sum place with great reviews just two blocks from here. Let’s go.” It’s integrated into Search, Maps and mobile and available as a new tab in Google+—creating one simple experience across Google. From the new “Local” tab on the left-hand side of Google+, you can search for specific places or browse for ones that fit your mood. 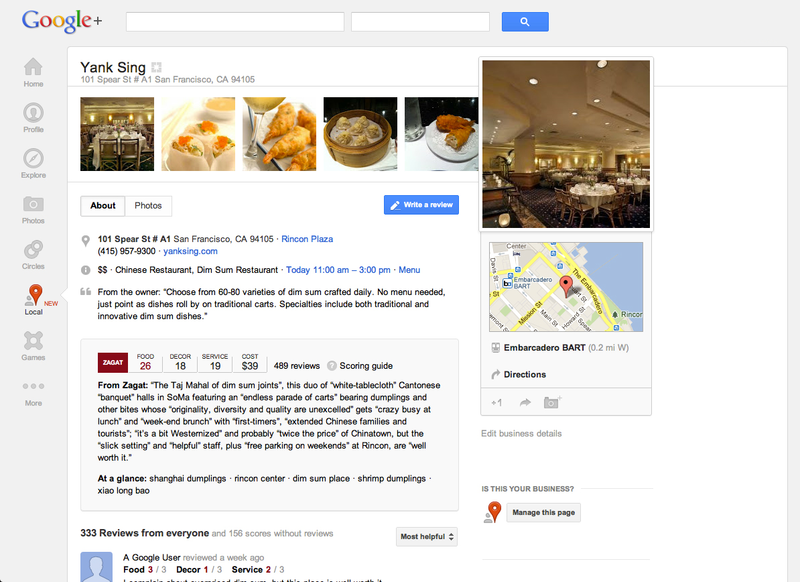 If you click on a restaurant, or a museum (or whatever), you’ll be taken to a local Google+ page that includes photos, Zagat scores and summaries, reviews from people you know, and other useful information like address and opening hours. 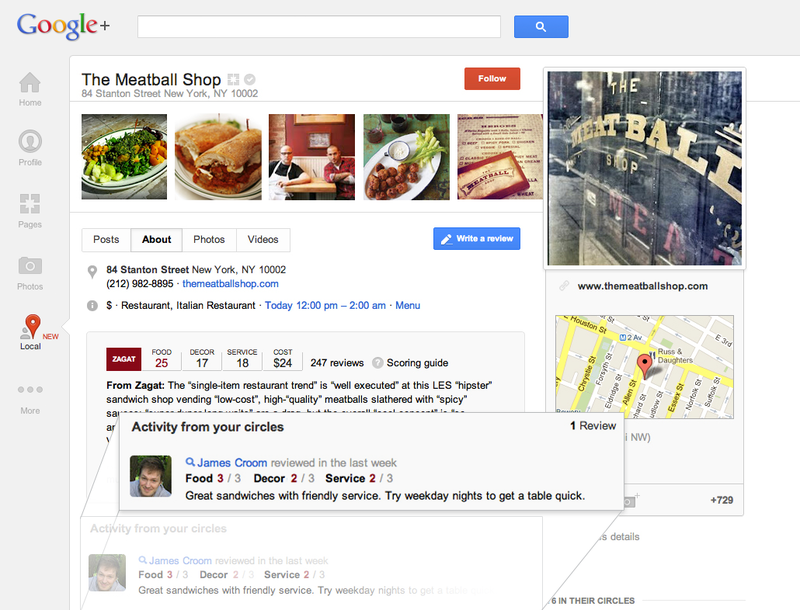 Google+ Local is also integrated across other products you already use every day. 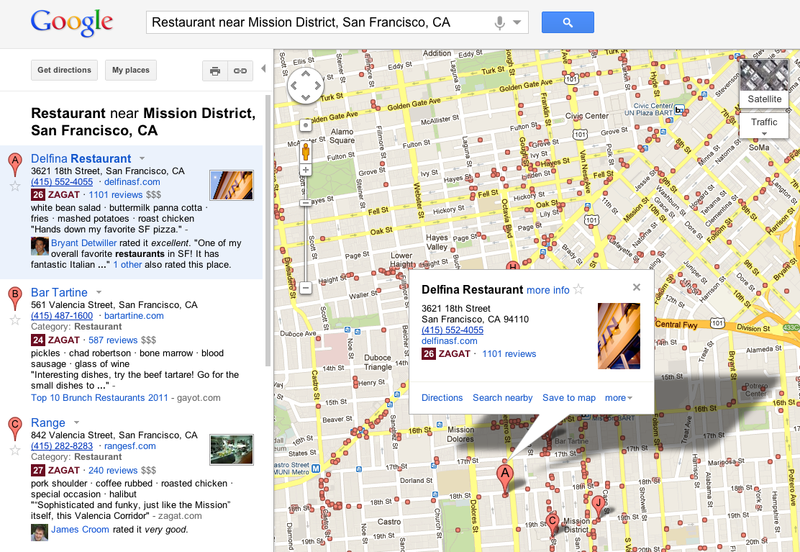 If you’re looking for a place on Search or Maps, you get the same great local information there too. 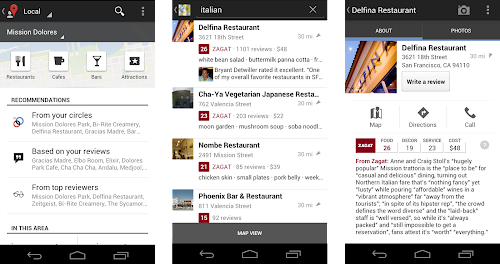 You can also take it on the go with Google Maps for mobile on your Android device, and soon on iOS devices. Since Zagat joined the Google family last fall, our teams have been working together to improve the way you find great local information. Zagat has offered high-quality reviews, based on user-written submissions and surveys, of tens of thousands of places for more than three decades. All of Zagat’s accurate scores and summaries are now highlighted on local Google+ pages. 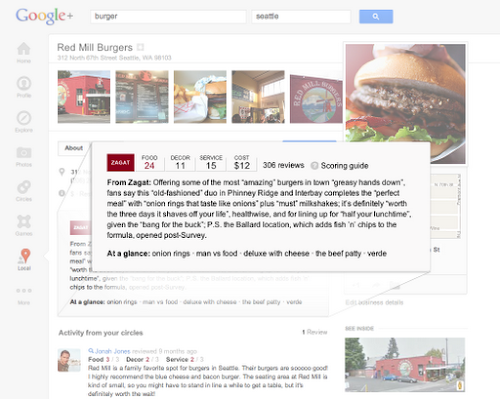 Each place you see in Google+ Local will now be scored using Zagat’s 30-point scale, which tells you all about the various aspects of a place so you can make the best decisions. For example, a restaurant that has great food but not great decor might be 4 stars, but with Zagat you’d see a 26 in Food and an 8 in Decor, and know that it might not be the best place for date night. Your friends know what you like, and they probably like the same things you do. That’s why the opinions of people in your circles are front and center. If you search for [tacos] on Google+ Local, your results might include a friend’s rave review of the Baja-style taco stand in your neighborhood. And if you’re searching on Google or Google Maps for a great place to buy a gift for that same friend, your results might include a review from her about a boutique she shops at all the time. You can also share your opinions and upload photos. These reviews and photos will help your friends when they’re checking out a place, and are also integrated into the aggregate score that other people see. 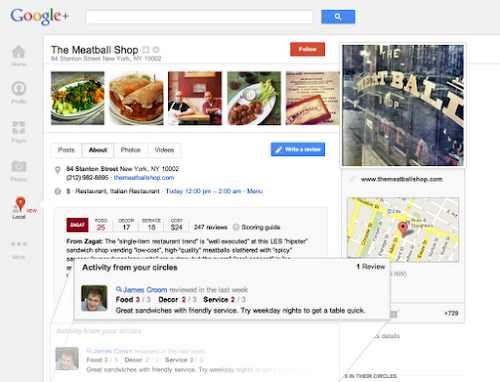 The more you contribute, the more helpful Google+ Local will be for your friends, family and everyone else. Whether it’s a block you’ve lived on for years or a city you’ve never been to before, we hope Google+ Local helps you discover new gems. Today is just the first step, and you’ll see more updates in the coming months. If you’re a business owner, you can continue to manage your local listing information via Google Places for Business. Soon we’ll make it even easier for business owners to manage their listings on Google and to take full advantage of the social features provided by local Google+ pages. Get more information on our Google and Your Business Blog. This entry was posted on Wednesday, May 30, 2012 at 6:22 AM and is filed under google+, googleplus, maps and earth, Search. You can follow any responses to this entry through the RSS 2.0. You can leave a response.